On Wednesday, September 30, Beebe Healthcare kicked off its year-long 100th Anniversary with a community event on the front lawn of Beebe’s Medical Center in Lewes. 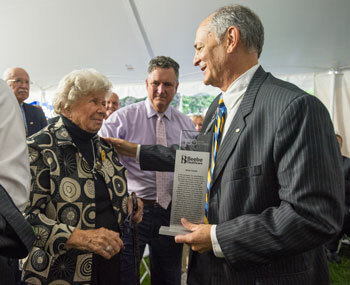 Rain did not deter the more than 500 people who gathered in front of Beebe as they recognized the commitment of the Beebe family, the passion of the Beebe team members, and the legacy of two doctor brothers. Dr. James Beebe and Dr. Richard C. Beebe founded Beebe Hospital in 1916 with a mission of bringing modern medicine Sussex County. 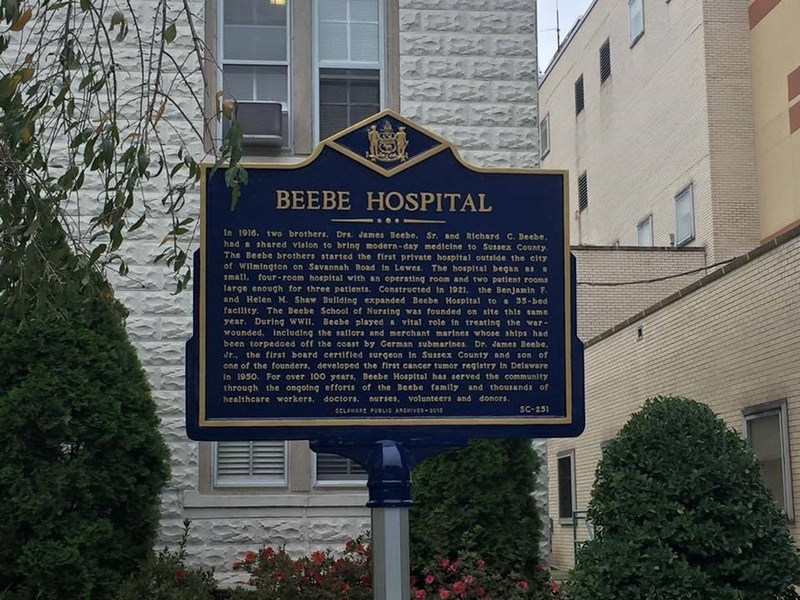 Beebe was the first hospital established outside the City of Wilmington in Delaware. During the September 30 event, Senator Ernie Lopez read the inscription which will be displayed on a historic marker placed in front of Beebe in Lewes. Events and educational activities will take place throughout 2016. A children’s book will be published and shared with schools and libraries in Delaware. There also will be a full-color, coffee table history book with photography by Kevin Fleming published during the year. For more details about the 100th Anniversary events and projects and to shop online for exclusive merchandise visit: www.beebehealthcareevents.org/100th-anniversary. Jeffrey M. Fried, President & CEO of Beebe Healthcare, right, talks to Anna Beebe Moore, as members of the Beebe family are recognized for their service and commitment to Beebe Healthcare. The Historic Marker presented by the Delaware State Archives stands in front of Beebe Healthcare’s Main Campus in Lewes.